Based out of Portland, Ore., Ben Rice continues his steady climb to the heights of the blues world with this tasty collection, which includes 12 blues and roots infused originals and one cover – produced with the assistance of some of the best talent on the West Coast. Even though Rice is barely into his 30s, he’s been making a major impression for the better part of the past decade as both a singer/songwriter and guitarist, fronting his own band and touring the globe frequently in support of two powerhouses – two-time Blues Music Association bass player of the year Lisa Mann and BMA female vocalist of the year nominee Karen Lovely. Ben enjoys a strong roots heritage, combining electric and Delta blues with soul, funk, rockabilly and jazz in the mix here. Early influences included Al Green, Alice Cooper, Teddy Pendergrass and Marshall Tucker, but quickly expanded to include by B.B. King, Big Bill Broonzy, Skip James and Mississippi Fred McDowell among others. A student of both jazz guitar and classical music at the University Of Oregon, his unique playing style also incorporates techniques he developed while playing Celtic folk and Mexican mariachi in bands during his college years. He regularly switches among electric, cigar-box and resonator guitars today. Rice burst onto the national scene in 2014, competing in the International Blues Challenge and leaving Memphis with the Albert King Award, which honors the best guitarist in the competition. He’s been building a global following ever since. 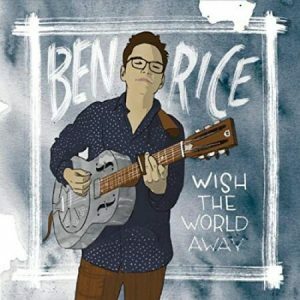 Recorded and mixed at Portland’s Roseleaf Studios under the direction of all-star drummer Jimi Bott, Wish The World Away is Ben’s seventh CD. He handles all vocal and guitar duties with a lineup that includes Bott handling percussion on five tracks and Dave Melyan on another. Harmonica master Mitch Kashmar appears on four cuts with Dave Fleschner contributing keyboards and Julio Appling bass on a pair each. Haley Johnsen and Natasia GreyCloud provide vocals on one cut each, and Paul Brainard makes a single appearance on pedal steel. The opener, “The Dirt Road Home,” finds Rice on resonator accompanied only by Bott on drums. A Delta blues in its purest form, it sings praise for living out in the country where cellphones go dead. Ben’s a melismic vocalist in addition to being an exceptional picker, and this tune puts both on crystal clear display. Appling and Fleshner join the action for “Peace Will Overcome,” an optimistic number in these troubled times, with Rice delivering sweet runs on slide. Up next, “Mojo Hand” is an uptempo Hill Country pleaser aided by Kashmar’s lilting harp runs and swinging shuffle patterns from Melyan in his only appearance. The title tune ballad “Wish The World Away” – about unhappy lovebirds yearning for a new start — features Rice in duet with GreyCloud, a former contestant on The Voice who’s now based in Nashville. Belying his youth, Ben incorporates a ‘40s feel for “The One That Got Away,” which swings from the jump that describes love both won and lost. Next up, the ballad “Hard Times” comes across with a Memphis soul feel fueled by Fleschner on Hammond B3 organ and gives Rice plenty of space to put his vocal chops on display while “If You Ever Change Your Mind” features plenty of red-hot guitar licks delivered with pre-War sensibilities. An interesting reinvention of Stevie Wonder’s “Higher Ground” follows before “Run Around” returns the sound to a propulsive first-generation country blues root. “Oh Lord” keeps the feel going with Rice weaving fingerpicking with Kashmar’s harp. The two closing numbers — “Get There” and “Don’t Worry Mama” – state Ben’s musical vision for the future and assure his mother that, no matter what happens, he’ll always remain at her side. Available through CDBaby, Wish The World Away isn’t your grandfather’s blues. But if you like great guitar work and new tunes that are both fresh and original with a deeply rooted traditional feel, this one’s definitely for you. Ben Rice is a young man whose star is starting to soar.